Father John Sullivan, S.J. died in 1933. For countless Irish families his name was synonymous with a prodigious gift of healing and with a humble dedication to the poor, the weak, and the ill.
Born into a prominent family on May 8, 1861, John Sullivan was, following custom at the time, baptized in his Protestant father’s Church of Ireland. Edward Sullivan, John’s father, was a successful barrister who would later become Lord Chancellor of Ireland. His Catholic mother, Elizabeth Bailey, came from a family of prosperous landowners. In 1872 John was sent to Portora Royal School. The excellent student then attended Trinity College, Dublin, where he studied the Classics. He later studied law and for a time practiced as a barrister. Lord Edward Sullivan died suddenly in 1885. John’s inherited wealth made him financially independent; he liked fashionable clothes, and was considered the best dressed man in Dublin high society. During this period of wealth and leisure John Sullivan traveled Europe widely, and even ventured forth on walking tours of Macedonia, Greece, and Asia Minor. Most unusually for his time, John Sullivan spent several months in one of the Orthodox Monasteries on Mount Athos. It is even said that he considered converting to Orthodoxy and entering there as a monk. This fact alone makes him a pioneer in Irish Catholic — Orthodox relations, something that the brilliant and colourful Archimandrite Serge Keleher (+11 November 2011) developed in later years. To his Catholic mother’s joy, John Sullivan was quietly received into the Catholic Church in 1896. His conversion to Catholicism was a turning point in his life. He actively sought a way of life marked by austerity. John exchanged his fashionable clothes for the most ordinary attire. On September 7, 1900, at the age of 40, John Sullivan entered the Society of Jesus. 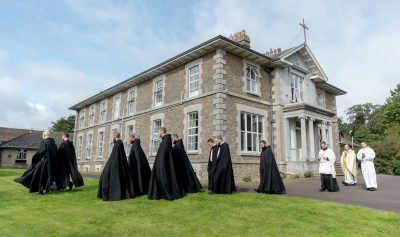 He was ordained together with the saintly Father Willie Doyle on July 28, 1907, and was appointed to Clongowes Wood College, where, although he was not judged the best teacher, he acquired his reputation as “a healing priest”. Father John Sullivan was, above all else, a priest who prayed much. Like his confrère Father Willie Doyle, Father Sullivan spent hours before the tabernacle. Often he was found kneeling in his room where he recited one rosary after another. He took to the roads on foot, praying as he walked, to visit the sick and bless them with a relic or with his crucifix. There are astonishing accounts of miraculous cures obtained at his prayer. Father Sullivan often read an Office from the breviary for those who asked his prayers; he had immense confidence in the power of the Holy Sacrifice of the Mass. Pope Francis declared the heroicity of virtues of Father John Sullivan, S.J. on 7 November 2014. Given his baptism in the Church of Ireland, his experience of Orthodox monasticism on Mount Athos, and his holy life and death as a Catholic priest of the Society of Jesus, The Venerable John Sullivan may well be considered Ireland’s most suitable patron of ecumenical relations.